Starting today, Dungeons & Dragons will live-stream a weekend of adventure with the Stream of Many Eyes, a unique, immersive celebration of the D&D community that kicks off the 2018 storyline called Waterdeep: Dragon Heist. Fans can tune in to twitch.tv/dnd now through Sunday evening to get a glimpse of key locations of the city of Waterdeep, including the Yawning Portal Inn and the Field of Triumph, custom built for the stream. Imagine flipping a gold piece to the barkeep for a mug of ale and interacting with iconic characters from D&D lore in a once-in-a-lifetime experience bringing Dungeons & Dragons to life. Stream of Many Eyes is D&D's follow-up to last year's raucous Stream of Annihilation, which saw actors, comedians, Twitch streamers and YouTubers congregate in Seattle for a celebration of all things D&D. This year, the action and production are ratcheted up even further, combining tabletop D&D, live-action puzzles, cosplay, and impressive sets to create an unforgettable, can't-miss live show. Woven into the performances and live games expect announcements, interviews, and a few surprises from the team behind D&D. Head to dnd.wizards.com/some to see more information, buy tickets to see live D&D performances from awesome entertainers, and view the full schedule for the Stream of Many Eyes programming starting at 4pm PT on June 1 and concluding Sunday at 8pm PT. The event is a celebration of the upcoming tabletop RPG release, Waterdeep: Dragon Heist available everywhere September 20, 2018. The book provides tons of detail for running adventures in a fantasy city such as Waterdeep, one of the grandest cities in the Forgotten Realms. Players need to use diplomacy, intrigue, stealth, and their wits to follow clues and solve puzzles in this daring, urban treasure hunt. Dungeons & Dragons is a fantasy roleplaying game and entertainment franchise, fueled by the imagination of fans around the world. It has been bringing gamers together for more than 43 years with its diverse offering of products, including books, video games, livestream entertainment and much, much more. 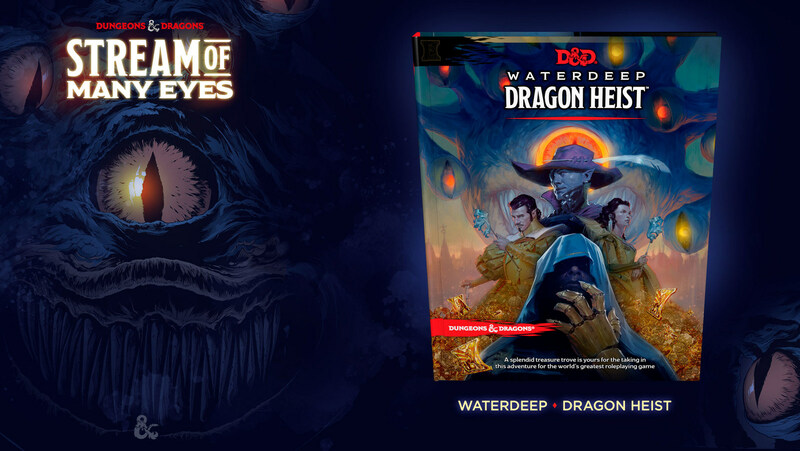 To find out more information on Dungeons & Dragons, the Stream of Many Eyes, Waterdeep: Dragon Heist and more, head to https://www.dungeonsanddragons.com/ and explore! Assets for this weekend's events can be found here: https://dnd.wizards.com/pressassets. visit the Wizards of the Coast Web site at www.wizards.com.